line drawn on a map of a particular region of the earth's surface connecting points of equal temperature; each point reflects one temperature reading or an average of several readings over a period of time. The relative spacing of the isothermal lines indicates a temperature gradient, i.e., the amount of temperature change over a given distance. an isogram of the temperature of air, water, or soil. Most commonly drawn are isothermal maps showing mean monthly air temperature over a number of years, mean temperature for any period of time, or the temperature at a definite moment of time. 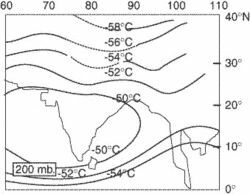 To eliminate the influence of elevation when drawing isotherms, temperature values are sometimes reduced to sea level, assuming that air temperature drops an average of 0.6 °C for each 100 m of increase in elevation. a line on a phase diagram depicting a process occurring at constant temperature (an isothermic process). The equation of the isotherm of an ideal gas is pV = const, where p is the pressure and V is the volume of the gas. For a real gas the equation of an isotherm has a more complex character and becomes the equation for the isotherm of an ideal gas only at low pressures or high temperatures. On a pV diagram, at the point of intersection of the isotherm and the adiabatic curve the latter is steeper than the isotherm. The isotherms of ferromagnets in J, H, coordinates, where J is the magnetization and H is the magnetic field intensity, have a similar character. A line on a chart connecting all points of equal or constant temperature. A curve or formula showing the relationship between two variables, such as pressure and volume, when the temperature is held constant. Also known as isothermal. The line on the weather chart joining places of equal temperature. These are normally drawn for even 5°C intervals. These lines are customarily indicated in red.